Here's a quick craft we did after breakfast the other day to make use of some of the bargain pack of colourful crepe paper I picked up from a supermarket sale shelf (just 10p for a pack with five rolls of colours). You will need cardboard tubes (e.g. toilet rolls, but we used postage tubes some big bottles of essential oils came in), PVA glue (called white glue I think if you're reading this in America), paintbrushes to apply the glue, crepe paper or other thin paper such as napkins or coloured tissue paper. Step1: seal up the end of your tube - taping a piece of card over the end would work, but we already had plastic stoppers on our tubes. Step 2: tear up coloured paper into bits - any size but we found inch sized chunks worked well for quick coverage without the boys getting bored. Step 3: paint glue on the tube, stick on the paper. Pretty straight forward. I painted mine over with PVA glue to get a shiny finish, Toby made paper balls so his tube had a more textured look, Ollie preferred to wrap his loosely in larger chunks of paper. 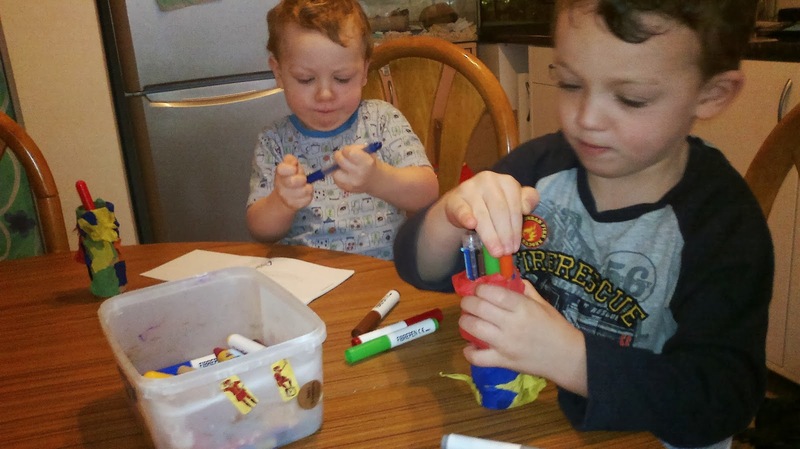 The learning opportunities encouraged by this simple activity include fine motor skills in tearing and handling the paper, creative thinking in choosing how the pencil pot will look, and feeling good because they end up with a great little object they can use afterwards. I have been amazed by how much time both boys have spent selecting which pens to put in their pots from the general pen tub each time we sit down to draw. It's fun to go all out on messy play, but I like keeping in mind some quick and fairly clean crafts we can do in fifteen minutes when I haven't got the time to devote to a major clean up operation afterwards.